Lawmakers grilled NASA chief Charles Bolden today (March 21), saying the deep cuts to NASA's planetary science program in the agency's 2013 budget request will "cannibalize" future Mars exploration and threaten America's leadership in space. Bolden testified before members of the U.S. House Appropriations commerce, justice, science subcommittee that approves NASA's annual budget in a hearing this morning in Washington, D.C. Throughout the nearly three-hour-long hearing, Bolden fielded tough questions from Republican and Democrat lawmakers alike. One particularly contentious topic was how cuts to NASA's planetary science division could jeopardize future robotic missions to Mars and other intriguing destinations in the solar system. President Obama's proposed fiscal year 2013 budget for NASA slashes funds for the planetary science program by $309 million — a more than 20 percent reduction of the money appropriated in the previous year. The proposed budget for planetary science includes a $130 million cutback in the agency's Mars exploration program. An artist's concept of NASA's Curiosity rover searching for interesting samples on the Martian surface. "It'll cannibalize the successful Mars program," Schiff said. "I don't think you can come here and tout MSL [Mars Science Laboratory]. This committee is about the future. To rely on MSL is to rely on our past. To say this is proof of our ongoing commitment to Mars just falls desperately short to me. I think that is a tragic place to be." Schiff's district includes NASA's Jet Propulsion Laboratory in Pasadena, Calif., which manages the Mars Science Laboratory mission. The MSL team members are currently gearing up to land a Mini Cooper-size rover, called Curiosity, on the surface of the Red Planet in early August. Still, Schiff expressed concern that the 2013 budget proposal takes away from NASA's rich history of robotic missions to Mars, and also ignores science priorities outlined in the National Research Council's Planetary Science Decadal Survey, which represents a consensus of the broad scientific community's goals for planetary science over the next 10 years. The decadal survey prioritized planetary science objectives and identified particular missions that were deemed deserving of NASA's investment. At the forefront is a series of missions to Mars in partnership with the European Space Agency to collect rock samples and return them to Earth. Second on the decadal survey's wish list was a mission to Jupiter's icy moon Europa. The increasingly cash-strapped fiscal environment forced NASA to bow out of the European Space Agency-led ExoMars mission, which aims to launch an orbiter and rover to Mars in 2016 and 2018, respectively. The ExoMars Trace Gas Orbiter, along with an Entry, Descent and Landing Demonstrator Module (EDM), form the first mission in the European-led ExoMars program. The Orbiter and EDM are scheduled to arrive at Mars in 2016. This image shows the Orbiter and the EDM in cruise configuration. Schiff viewed NASA's withdrawal from the sample return mission as an indication that the agency has decided to walk away from the decadal survey's objectives. But Bolden assured the panel that NASA is still committed to fulfilling the goals of the decadal survey, and that a sample return mission to Mars is still a top priority. The California Democrat remained unconvinced, insisting that the current proposal is one that he cannot accept. "Those are all fine words, but they don't make it so," Schiff said. "I wish we could all get by on good words, but what matters are the deeds." Rep. John Culberson (R-Texas) shared Schiff's sentiments, saying the proposed planetary science cuts are "unacceptable," and NASA's vision for future robotic exploration is "not consistent with reality." "I grieve for my country — I grieve for NASA," Culberson said. "There's no way you can say the planetary program can survive a cut of 21 percent." Meanwhile, some 2,000 space scientists are gathering this week at the 43rd Lunar and Planetary Science Conference in The Woodlands, Texas. Angry scientists at the conference, including noted Mars scientist Steve Squyres, a professor at Cornell University in Ithaca, N.Y. and principal investigator for NASA's Opportunity rover on Mars, are pushing back, and are rallying to restore the agency's planetary science budget. But Bolden defended NASA's Mars program, and pointed to MSL's expected arrival at Mars in August as a sign that exploration of the Red Planet is ongoing and vibrant. He also said the rover's tricky descent and landing will be challenging for him and the agency. 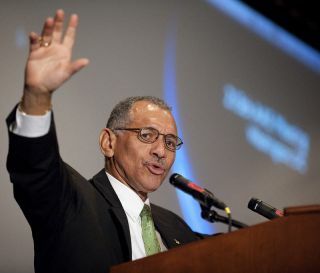 "I think you'll see the finest level of performance of our Mars program," Bolden said. "Humans around the world will be able to see color, 3-D images from the surface of Mars. That has never been done before. Once I do that, hopefully you will be as excited as I am about the Mars program."